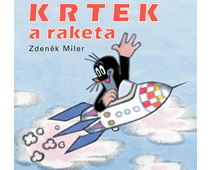 Famous Czech cartoon character Little Mole (Krtek or Krteček) will join the last flight of space shuttle Endeavour into space. U.S. astronaut Andrew Feustel will take a 19-centimeter toy version of the character as a personal item onboard the space shuttle. 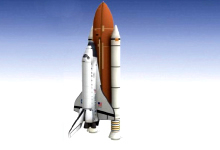 Mr. Miler then approved of a toy designed specifically for NASA and of Krtek’s mission logo. All of his work on sending Krtek to space has been pro bono. Krtek’s space flight was also supported by the U.S. Ambassador to the Czech Republic Norman Eisen. “Who would have believed that the Little Mole would actually make it into space one day on a real rocket,” said the Ambassador who, according to his own words, watches and reads Krtek’s stories with his own family. On his last trip to space in 2009, Andrew Feustel, whose wife is partly of Czech origin, carried a book of poetry by Czech writer Jan Neruda titled “Cosmic Songs”. For his next flight, Drew Feustel wanted to select an item that would capture attention of both children and adults. Krtek was then identified as an item that almost every Czech can relate to. Both Miler and Feustel were especially delighted to see that the project of sending Krtek to space will be accompanied by a broad variety of educational activities organized by the initiators of the project – the American Center of the U.S. Embassy in Prague, Czech Space Office, and the Astronomical Institute of the Czech Academy of Sciences. “It is our hope that with Krtek’s help, our mission inspires students and adults to excel in the study of science, technology, engineering and mathematics that will be essential to future space exploration and beneficial to human kind,” said Andrew Feustel in a video message sent to Prague’s American Center. The educational activities take place all around the Czech Republic and include mostly talks about the space, space exploration and space flights. The project has a substantial online presence – a special website for Krtek and the Endeavour’s mission STS-134 has been set up. Krtek’s space voyage can also be closely followed on Facebook, which serves as an interactive platform for its users – they can stay up-to-date with Andrew Feustel’s and Krtek’s mission and see photographs from project’s activities. Facebook is also used for announcements of competitions.